Upon your arrival, you will be met in Ataturk Airport in Istanbul, the only city which straddles two continents, Europe and Asia. You will be transferred to FOUR STAR Hotel Istanbul for the night after a short orientation tour. The rest of the day is leisure for you. Enjoy a full day tour of sightseeing, discover the Byzantine and the Ottoman Relics; visit Saint Sophia Museum, one of the world’s greatest architectural marvels, built by Constantine The Great in the 4th century and reconstructed by Justinian in the 6th century. Then visit Sultanahmet Mosque, built in the 16th century, unique with six minarets and its magnificent interior decoration of the blue Iznik tiles. See the Ancient Hippodrome, once was the scene of chariotraces, with three monuments: the Obelisk of Theodosius, the bronze Serpentine Column and the Column of Constantine. 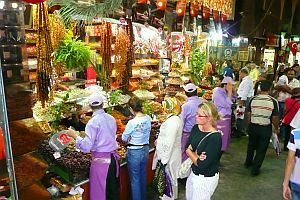 Before lunch visit the grand Covered Bazaar within over 4000 tiny shops. 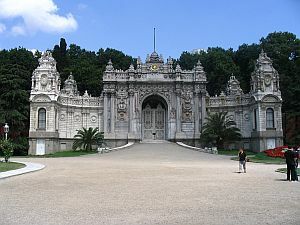 Visit Royal Topkapi Palace, the great palace of the Ottoman Sultans from the 15th to the 19th centuries. 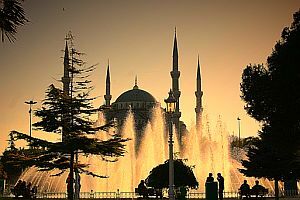 Then visit Suleymaniye Mosque, built in 1550 by the famous architect Sinan, emphasized with four minarets rising one from each corner of the courtyard. You will be transferred back to FOUR STAR Hotel Istanbul in the early evening for the night. B.L. Early in the morning, enjoy a full day tour to Bosphorus and Asia; visit the Egyptian Bazaar (Spice Market) and then embark on a boat, sail along the waterway separating Europe and Asia, while passing the magnificent DolmabahcePalace under Bosphous Bridge, the Fortresses, villas and small fishing villages. Then Rumeli Fortress(FROM THE SEA-NO INTERIOR VISIT); built by Mehmet in 1453, prior to the conquest of Istanbul, one of the most beautiful worksof military architecture. After lunch in a Turkish local restaurant across Bosphorus Bridge, visit the summer residence of the Ottoman Sultans with its Harem on the Asian side. Then see the panoramic view of Istanbul and Bosphorus from Camlica Hill, the highest point of Istanbul. 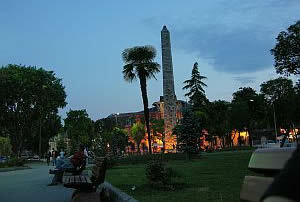 You will be transferred back to FOUR STAR Hotel Istanbul in the early evening for the night. B.L. After breakfast you will be picked up from your hotel for your departure flight to home. B. 3 nights’ accommodation at the four star Hotel in Istanbul, round trip airport transfer & ground transportation, 2 full days’ city tour with a professional guide including museum fees and lunch, service charges and taxes, daily breakfast.